The mission of the Arapahoe Band Boosters (ABB) is to support the music education and experience of students at Araphoe High School. We support the Marching Band, Pep Band, Concert Band, Symphonic Band, Wind Ensemble, Jazz Band, Color Guard, Winter Percussion, Symphony Orchestra, Pit Orchestra and multiple small ensembles involving students at Arapahoe High School. The Arapahoe Band and Color Guard is one of the most visible groups in our community and the impact that it has on the students involved is quite extensive. 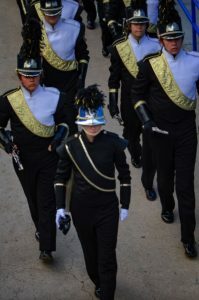 The Band is known as the “PRIDE OF ARAPAHOE” and the students strive to maintain that reputation every time they set foot into the classroom or on the field. The band represents Arapahoe High School and Arapahoe community annually in the Western Welcome Week parade, Denver Parade of Lights, AHS spring musical, and various other performances at public and private events around the Denver Metro area. The Arapahoe Band has been an integral part of the Arapahoe community since the school opened in 1964. 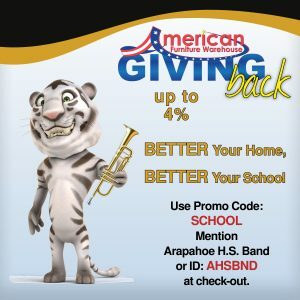 The Arapahoe Band Boosters, incorporated in 1975 as a 501C3 organization, has provided financial and volunteer support every year with the goal of providing Arapahoe students with a high quality musical education. The Arapahoe Marching Band has been a 16 time Colorado bandmasters Association State Finalist. The Arapahoe Band has been invited to participate in various performance tours all over the world including the Macy’s Thanksgiving Day Parade, London New Year’s Day Parade, Philadelphia Mummer’s Day Parade, numerous performances at Carnegie Hall, Disney Magic Music Days at Disneyland and Disney World, numerous performances at the Sacramento Jazz Jubilee, and various other locations. The entire Arapahoe community is proud of the accomplishments of the Band and Color Guard and the students and staff take pride in the history and ongoing quality of the program.